A beautiful seaside resort and fishing town surrounded by nature, Balchik seems much more enticing than its more crowded and commercial counterparts further down the coast. 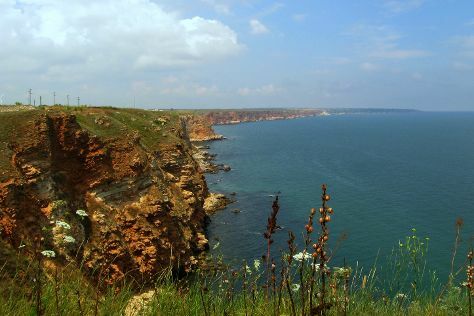 You'll enjoy a bit of beach vacationing at Cape Kaliakra and Irakli Beach. Explore the numerous day-trip ideas around Balchik: Varna (Stone Forest, Cathedral of the Assumption of the Virgin, & more). Spend the 24th (Sun) exploring the collection at Palace and Botanical Gardens of Balchik. There's still lots to do: cool off at Aquapark Aquamania. To see other places to visit, where to stay, reviews, and more tourist information, use the Balchik online itinerary creator. If you are flying in from Romania, the closest major airport is Varna Airport. July in Balchik sees daily highs of 34°C and lows of 20°C at night.